Candlewick Press, 2014. 48 pages. 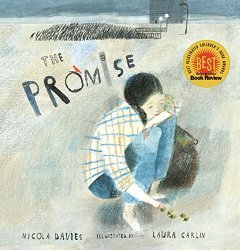 The Promise is a simple picture book about planting trees -- and thus transforming a "sad and sorry city." The pictures show the change from sad and gray and brown to happy and bright and colorful. It's the story of a girl who stole a purse from a woman who wouldn't let go until she promised to "plant them." The purse was full of acorns. The girl understood her promise. I forgot the food and money. rich beyond my wildest dreams. my head full of leafy visions. Neither the text nor the pictures are long on details. People might quibble over how it would work. But this is a picture book for children, and I believe children will get it. breathing to the sky, drawing down the rain like a blessing.